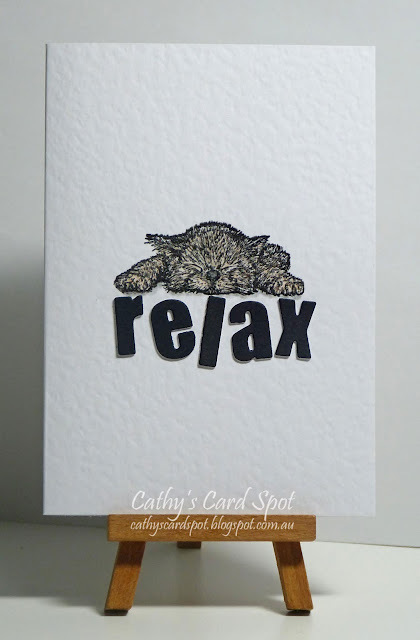 Cathy's Card Spot: Relaxed kitten! Hi everyone, I,m glad it's the weekend again, work has been so busy with new systems and lots of training, I definitely need to relax! I've had this kitten stamp for a little while, and recently bought the relax die from Stamplorations. I thought when I bought it that the letters would be connected but then was glad they weren't so I could lay them out in a wonky line. 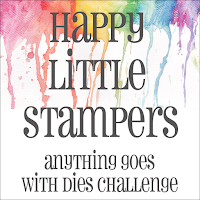 At Addicted to Stamps & More the theme is to make your mark. The kitten is stamped with versafine ink, clear embossed and coloured with Prismacolour pencils. I've also added some shading under the kitten. 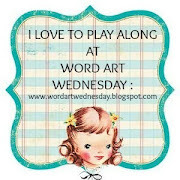 and it's anything goes with a sentiment or given bible verse at Word Art Wednesday. At Stamping Sensations this month it's anything goes so long as a stamp is the focus of your card. Versafine ink & clear embossing powder; Nellie Snellen stamp ANI009; Stamplorations relax die; Prismacolour pencils. A super CAS creation creation for our June challenge at Stamping Sensations, many thanks for joining in. Fabulous card, we should all take a lesson from your kitten. And relax he did! This is adorable and I love the fur. Perfect card! I love it. Super simple and such a fun card Cathy. Totally adorable. Thanks for sharing with us at ATSM this week. Ditto what I said with my DT hat on Cathy. Ina. Love your cute puss cat, super CAS too. Cathy this is adorable and the cat is really relaxed, very much like the one that I have at my feet right now. Ohhh my goodness Cathy saw this card and had to laugh, the cat is just perfect. So relaxed its not funny and the sentiment is just wonderful the way you have done it. Perfection.